How did we survive before the Internet and smartphones? Access to reams of instantaneous information, verified or not, has become a basic expectation, influencing all forms of personal and organizational decision-making. But simply having access doesn’t guarantee the quality or relevance of that data to support informed decision-making. Transparency is one of today’s most critical drivers of business success. Customers, investors, regulators and employees make decisions about where to shop, invest, investigate, and work based on how much they know about and trust an organization. So, how can we better manage transparency in a landscape where nearly everything is public? Companies are disclosing more than ever on environmental and social governance. Currently, around 92% of the world's biggest 250 companies produce annual sustainability reports, and we regularly speak to companies that feel confident in their current levels of transparency because they are reporting on their social and environmental impacts. But, it’s become clear that we’ve missed the boat with sustainability reporting. Reports such as this one by World Vision, and this one by the NGO Solidaridad, using public disclosure as a way to assess how companies are addressing human rights risks in their supply chains, reveal that we have a long way to go when it comes to transparency – both in what information companies share, and how they communicate. Selective transparency (let’s call it transparency 1.0) has failed. Consider the case of Volkswagen; just days after a self-congratulatory announcement regarding its performance in the Dow Jones Sustainability Index (DJSI) for its code of conduct, compliance, climate strategy and life cycle assessment, the company was accused of using devices to cheat regulations regarding emissions standards on vehicles. We know that transparency has a direct impact on trust. According to SAI Global's inaugural Consumer Trust Index, 83% of consumers rate transparency and ethical behaviour as the greatest trust builders. The bad news is that we trust less than ever. The latest Edelman Trust barometer reveals that for the first time since tracking began, public trust in business, government, NGOs and the media has declined across the board. Business leaders understand this link between transparency and trust and are taking action. Recently, Campbell’s announced it was leaving the Grocery Manufacturers Association at the end of 2017 citing conflicts around views on consumer transparency. Campbell’s was striving for more transparency on GMO labeling and other public policy issues impacting consumer trust. Now, knowing that being transparent is not an option and seeing how selective transparency has failed, why not start sharing better information, differently? Think of it as the Transparency 2.0 advantage; it’s all about people and context. 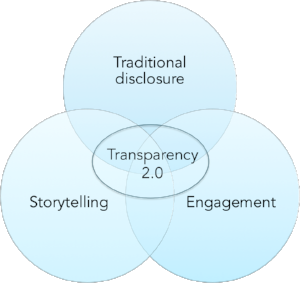 At INLE, when we work with clients looking to improve their transparency and build trust, we focus on the integration of three core tools: traditional disclosure, storytelling, and engagement. Before launching in, a company first needs to understand how transparent it actually is, and where there may be gaps. Fortunately, The Canadian Centre for Food Integrity and its American counterpart will soon be offering an assessment tool to help companies understand current levels of transparency and identify weaker spots. Their research on public trust in the food and agriculture system is informing widespread growth in an industry currently working hard to improve its transparency. With this in mind, a company can then develop a transparency plan by integrating the following three tools, reflecting both your business goals and your stakeholders’ interests and expectations. While we can agree that sharing data on ESG performance helps improve internal processes and takes stock of that performance, there remains a disconnect between why companies report and what stakeholders need to make informed decisions and build trust. If your organization is not already participating in some form of traditional disclosure, gathering accurate and material baseline data that can be compared internally and with peers year on year, is a start. The most important aspect of this process is a materiality review to identify the key issues, impacts and concerns your company and your stakeholders share in relation to the company’s activities. But data alone is meaningless if not placed in context. Once you’ve identified your material issues, established a baseline, and set targets, decide what data needs to be communicated, to which stakeholders, and most importantly, why. We know that the audience for sustainability reports are largely shareholders, investors and peers, so consider integrating your sustainability data into your annual corporate reports and then place the data in context for other stakeholders through engagement and storytelling. As organizations collect, track and report data on social and environmental issues we are left with more technical and increasingly complex information to communicate. While being transparent about the specific data points is important, what makes it more meaningful is placing the data in context, focusing on the bigger picture and sharing it in a way that resonates with those you are trying to reach. Good storytelling demands that we place people and communities at the centre, not business, and focus on the lived experience: the people involved, the choices they made, and why they made them. Would you rather read about how many dollars a company spent on community investment projects? Or hear the story of a community organizer who was able to improve access to healthy food for her entire neighborhood? It’s the underlying human truth in a story that resonates, not the key performance indicators. To learn more, The Embedding Project offers this resource for organizations seeking to understand what storytelling looks like in practice and reflect on what that means for your organization. Companies like Patagonia have produced videos telling various pieces of their social and environmental responsibility stories, a format that better reaches audiences who get their information from social media, rather than traditional formats. The most effective way to elevate transparency efforts is through consistent, meaningful, two-way engagement with your stakeholders. It also happens to be the most resource intensive, so begin by assessing the level of engagement most appropriate and realistic for your organization’s specific needs and the needs of your various stakeholders. We often assume everyone wants to be engaged on all information all of the time; this is false. Some people simply want access to specific information that impacts them, while others want to provide feedback and understand how their input has been considered on a more consistent and regular basis. The International Association of Public Participation (IAP2) presents a useful framework for choosing a level of engagement, depending on your goal. Once the desired level has been determined, then choose appropriate platforms for the stakeholder. Digital channels, such as Twitter, have opened up new ways for companies to communicate directly with stakeholders, and stakeholders with one another. Some food companies have used web platforms to enable two-way engagement such as McDonald’s Our Food, Your Questions website, where consumers can review answers to other questions or post their own, which the company commits to respond to directly, and Campbell’s What’s In My Food? site where consumers can search by product to see ingredient lists, understand why Campbell’s makes certain choices about how to source ingredients, and how products are labelled. It is worth noting that while today’s consumer is looking to align with companies with which they share values, they are also savvy consumers of media and are quick to see through attempts at “purpose-washing” through marketing campaigns. Transparency efforts approached as a public relations or marketing campaign may be effective in the short term but will ultimately alienate the very people you are trying to reach. As in relationships between individuals, trust builds through authenticity and meaningful, two-way conversations over time. Motivations matter. Make sure you understand what is driving your transparency efforts to ensure alignment with organizational values and goals. Ultimately, it is about relationships and those built on a foundation of trust and transparency are going to be more successful in the long-term. Older PostCould your business be profiting from slavery?